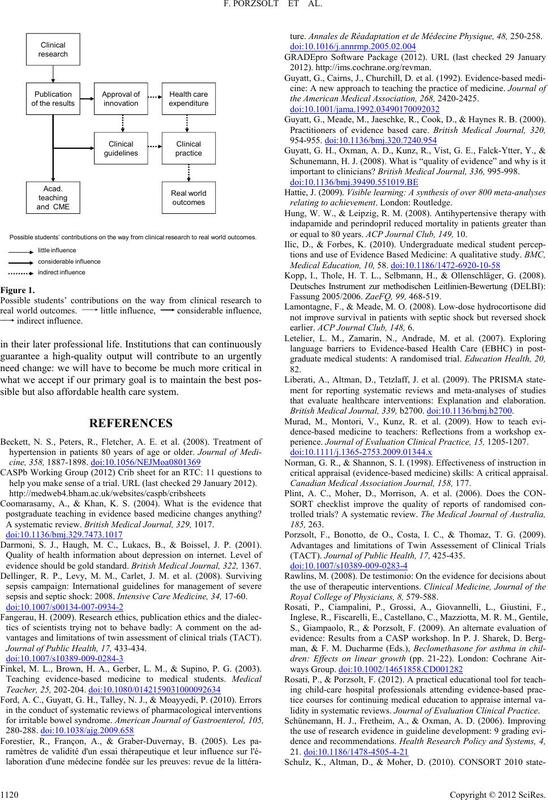 ment we became aware of important dif ferences betw een medical stud ents and th e users of clinica l rese a r c h.
who constitute the active users of research. sions lasting several hours (Porzsolt et al., 2009). sive, fast and acceptable to the users of EBM. session because additional background information was needed. 1 Study question clearly stated? 2 Design appropriate to answer study question? 3 Can the study design be used in a confirmatory study? 4 Study cond ucted prope rly? 5 Appropriate endpoints selected to answ er study question? 6 Risk profiles of the study populat ions similar? 7 Allocation to study groups concealed? 8 Doctors and patients continuously blinded? 9 Follow-up long enough to detec t endpoints? 10 All patients included in reported results? 12 Results possibly influenced by conflicting interests? 13 Validity of report acceptable? 14 Described effect clinically relevant? analyzed studies and finally a consensus statement was created. This assessment is only the first step of a complete appraisal. sals are compl ete d must not be challenged. pating patients and those reported in the final evaluations. col was edited during the group meetings. study design which could be used to answer the study question. sign used in the publication analyzed. in the study were also included in the calculation of the results. method used in the trial. significant publications of cardiovascular literature in 2008.
were all patients included in the reported results (Table 2). study some because the local investigator died or retired. did not find a proper reasoning for this kind of data analysis. Results of the assessment of two studie s10,11 as presented in our project. 4 Study conducted properly? No. Patients with exclusion c rit eria were included. 10 All patients included in reported results? Yes No. See Figure 1, page 1891.
meaningful conclusions for clinical practice. differences between the ACP reviews and our reviews. clinical commentators of ACP Journal Club synopses.  Our assessments are usually not prepared for publication. cardiovascular literature in 2009 (Becket et al., 2008). to complete valuable critical appraisals (Finkel et al., 2003). result of the entire process, has to be made by the clients, i.e. (Rawlins, 2008; Schulz et al., 2010). will probably depend on the depth of the critical discussion. far as these questions are related to RCTs. 2009; Rosati et al., 2012). formation which has been accepted by experts and is published. The information is provided within a short time at low expense. Comparison of the CA SP que st ion nai re and the questionnaire used in this proje ct.
Did the trial address a clearly-focused issue? Design appropriate to answer study question? A2 Was the assign ment of patients to treatments randomized? A3 Were all of t h e patients who entered the trial properly accounted f or at its co n clusion?10All patients included in reported results? 7Allocation to study groups concealed? Were patients, health workers, and study personnel “ b lind” to treatment? 8Doctors an d p atients continuously blinded? B5 Were the groups similar at the start of the trial ? social class 6Risk profiles of the study popula tions similar? 4Design appropriate to answer study question? B7 How large was the treatment effect? What outcomes were measured? 11Described effect clinically relevant? B8 How precise was the estimate of the treatment effect? What are its conf idence intervals limits? C9 Can the re s u lt s b e applie d t o the loca l po pulation? your population? 3Can the study design be used in a confirmatory study? C10 Were all clinically important ou tcomes considered? If not, does this affect the decision? 5Appropriate endpo ints selected to answer study question? C11 Do the benefits outw eigh the harms and costs? This was probably not addresse d by the trial, but what do you think? 11Described effect clinica lly relevant? Quality criteria incorporated into GRADE system. General Depending on the context and study type, there can be additional limitations than those list ed above . Guideline panels an d authors of systematic reviews s hould consider all possible limitations. Possible students’ contributions on the way from clinical research to real world outcomes. sible but also affordable health care system. help you make sense of a trial. 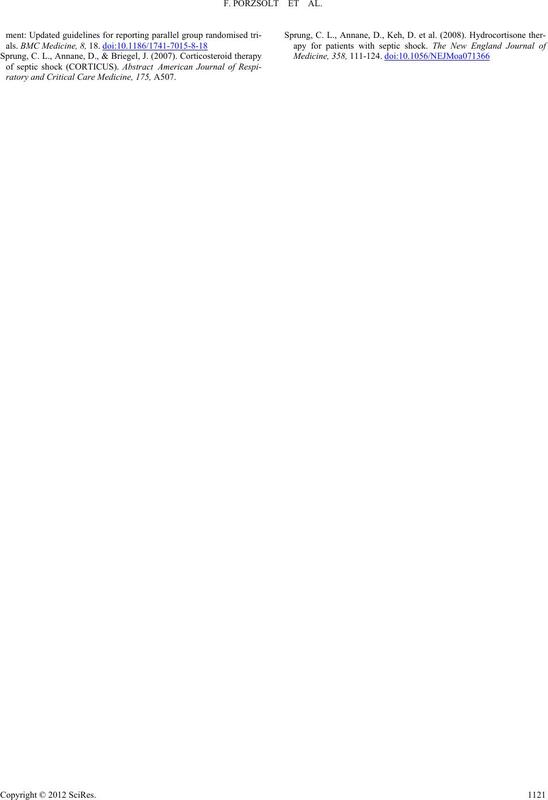 URL (last checked 29 January 2012). postgraduate teaching in evidence based medicine changes anything? A systematic review. British Medical Journal, 329, 1017. Darmoni, S. J., Haugh, M. C., Lukacs, B., & Boissel, J. P. (2001). evidence should be gold standard. 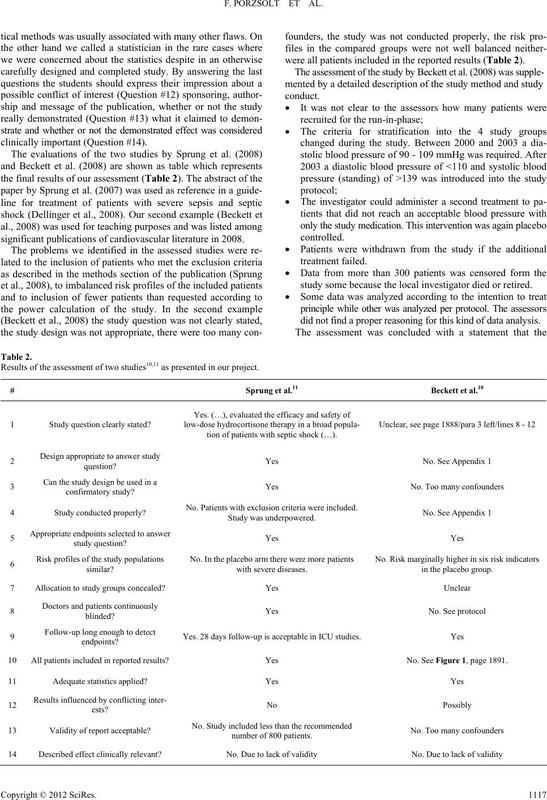 Brit i s h Medical Journal, 322, 1367.
sepsis and septic shock: 2008. Intensive C ar e M ed ic in e, 3 4, 17-60.
vantages and limitations of twin assessment of clinical trials (TACT). Journal of Public Health, 17, 433-434. Finkel, M. L., Brown, H. A., Gerber, L. M., & Supino, P. G. (2003). ture. Annales de Réadaptation et de Médecin e Physique, 48, 250-258.
the American Medical Association, 268, 2420-2425. Guyatt, G., Meade, M., Jaeschke, R., Cook, D., & Haynes R. B. (2000). important to clinicians? British Medical Journal, 336, 995-998.
relating to achievement. London: Routledge. 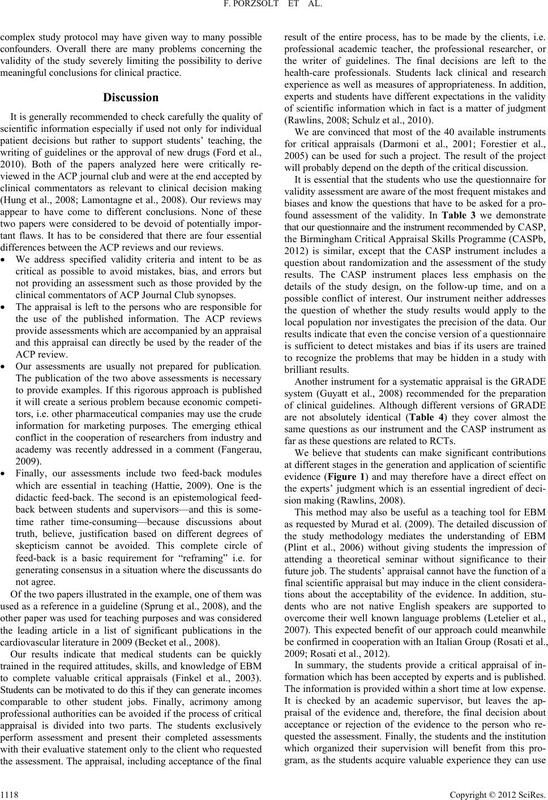 or equal to 80 ye a r s. ACP Journal Club, 149, 10. Kopp, I., Thole, H. T. L., Selbmann, H., & Ollenschläger, G. (2008). Fassung 2005/2006. ZaeFQ, 99, 468-519.
earlier. 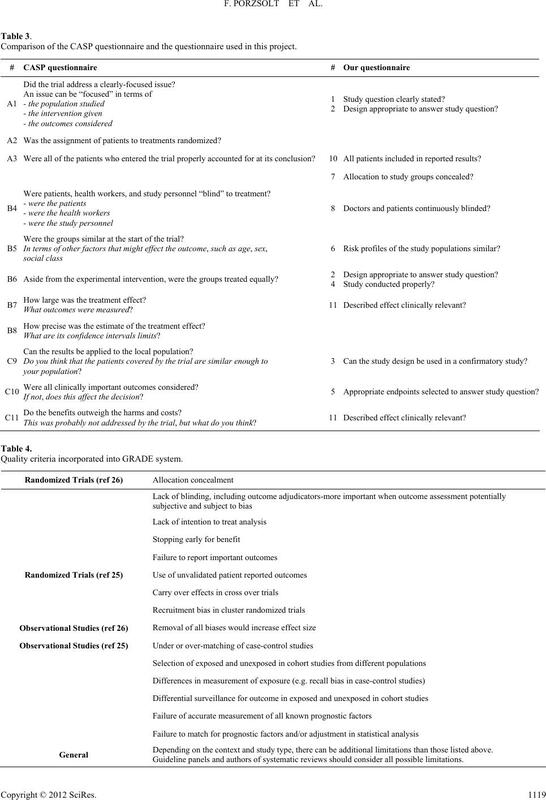 ACP Journal Club, 148, 6.
that evaluate healthcare interventions: Explanation and elaboration. British Medical Journal, 339, b2700. doi:10.1136/bmj.b2700. perience. 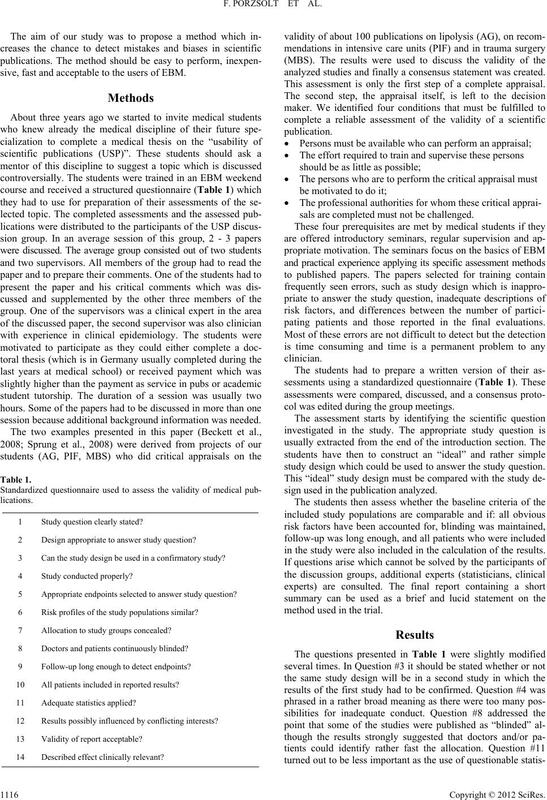 Journal of Evaluation Clini c a l Practice, 15, 1205-1207.
critical appraisal (evidence-based medicine) skills: A critical appraisal. Canadian Medical Association Journal, 158, 177. Porzsolt, F., Bonotto, de O., Costa, I. C., & Thomaz, T. G. (2009). (TACT). Journal of Public Health, 17, 425-435. Royal College of Physicians, 8, 579-588.
lidity in systematic reviews. 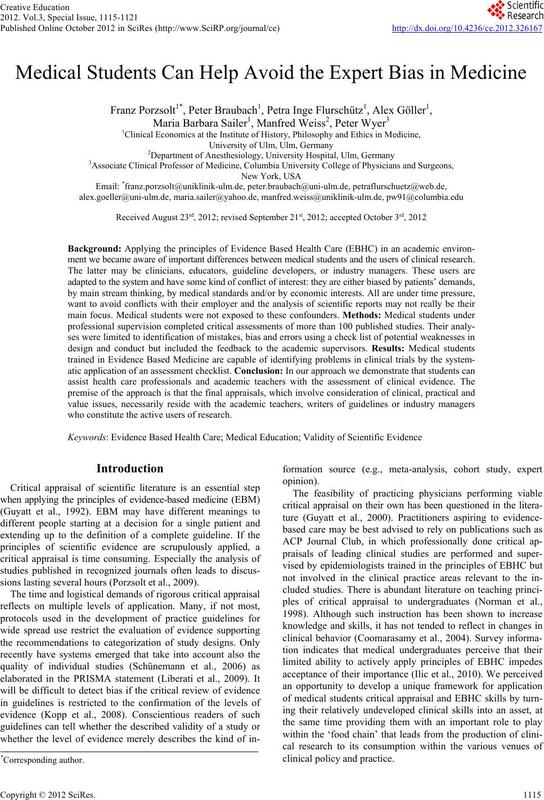 Journal of Evaluation Clinical Practice. ratory and Critical Care M ed i c i n e , 175, A507.